If you’ve seen my GoodReads widget, you know I’m engaged on the long slog epic journey through the Wheel of Time mess series. I poke fun, but actually I’m kind of enjoying it. Book-by-book, they’re addictive once you’ve settled in, and the story is the immersive, sink-your-teeth-into-it type that we fantasy readers love. But Jordan uses a plot trick that really irks me. Thirty or forty pages into every book, an exciting event occurs, and some smarty-pants character has to explain that this is one way the High Muckety-Muck’s Prophecy of Doom and Glory will be fulfilled. Smarty-Pants then tells Questing Character that he or she must go to Some Random Place, seek the Mystical Golden Eggbeater of Power, and then kill a lot of people. 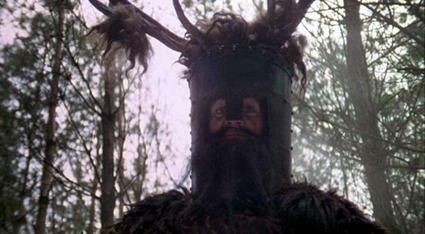 It’s much akin to the Knights Who Say Ni sending King Arthur to fetch a shrubbery. Do it if you want to advance the plot! There has to be a better way to do this. I realize that you can’t plant every plot device in the first book (Man, I wish you could! ), and that subplots—or even the plots of individual books in a larger series—often revolve around a MacGuffin simply because an author needs characters to get a certain piece of the puzzle before they can carry on. I can’t just blame Jordan for this. Loads of fantasy novels (especially epic fantasy) do it. You could even argue that the treasure-quest in The Hobbit is just a drawn-out way to get the One Ring to Bilbo and then to Frodo. I don’t completely object to this type of plotting: after all, we read stories as much for the journey as for the ending. I can object, though, to authors making one particular character into the sole source of information. (Moiraine, Hermione, I’m looking at you.) It irks the characters in the book to be bossed around by a single person, and it irks me to read it. Let characters learn information on their own! Let them seek and discover! That’s way more interesting than a lecture from Ms. Smarty-Pants. I think urban fantasy novels tend to do a better job with this, perhaps because they’re often formulated as mysteries, perhaps because they’re shorter. Think about how often Harry Dresden falls into one horrible situation after another, just because he doesn’t (always) have a character who can give him all the information he needs—and that’s a compelling read, because we get to put the pieces together with him. Plus, it’s fun to see how he’ll get out of his next scrape. My tactic (and it’s a cheap ploy) is to scatter the info-dumps among many characters. This character moves in high society, so he would know about this. That character is a fairy, so she probably knows about that. When providing information, how do you avoid writing smarty-pants characters? Ummm..give them a silly hat? And I have a habit of having characters that are researchers, archaeologists, librarians — I really enjoy writing “in-world” books, snippets etc. It’s just another clever mask for plot exposition, but I dig having the “Questing Character” actually figure it out for themselves. I enjoy in-world snippets, too. My thing is newspapers… So far I’ve written 19th-century fantasy and urban, so I get to work in my old newswriting skills AND do some exposition. And silly hats work. Fezes are cool. Ulp — now I know you’re a Whovia. BEST FRIENDS FOR LIFE. YES. I knew it. It’s like a secret handshake, and I knew you’d get it. I try to scatter it about myself as well. Or sometimes have my character discover it on her own — even if she gets it from a book, I try to add a twist. I don’t want to give any WoT spoilers, but I feel like that plot device disappears. I never really noticed it or had a problem with it, probably because having a “Merlin” figure is one of the classic elements of high fantasy. Merlin, Gandalf, Belgarath, Polgara, Moiraine, etc. Ha, guilty as charged — it’s tough to fight the bone-deep desire to put your own spin on the “wise wizard.” Mine rides a skateboard and punches bears. It is classic, but it can also be a bit more subtle, I think. Plus, Gandalf is semi-divine, so that gives him a free pass for a few annoying know-it-all speeches. I’m a Real fan of those Psychological thriller shows where the readers/Viewers are given a lot of information and can work things out themselves. Liar game, the Manga/J-Drama is especially good at this – Basically, the rules of each ‘Game’ are given out in full at the start, and the story/tension comes from the players trying to beat each other at the game. As someone reading it, I’m given the same rules so I can work out my own strategies and plan along with the characters. Death note and Bloody Monday do similar things, but on a smaller level. I Try ‘Copy’ that – I like to give readers and my characters as much information as they can, and have the characters work things out on their own. In my view, having characters told what to do is a very poor plotting device, and I never use it if I can help it. Instead, I’ll give my characters the information they need to formulate their own plans. Essentially, I always have my characters with A) Implementing their own plans or B) Reacting to the moves of my antagonist. Usually B, because until the end my protagonists tend to be playing catch up.